Data that already exists - existing information that you gather and analyse but which has already been generated e.g. official statistics, letters, newspapers. This is often used to inform primary research. Data which are expressed textually instead of in a numerical form. Qualitative data are compsed of rich descriptions of social life. Research methods such as observations or focus groups generate this type of data. Data which are expressed in a numerical or statistical form. It is useful for establishing patterns or trends and identifying similarities and differences between phenomena. 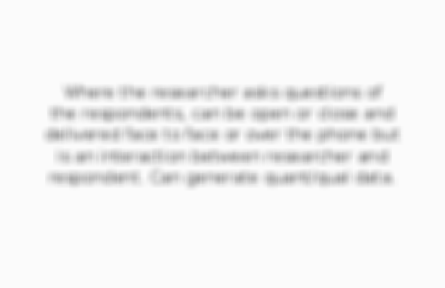 Where the researcher asks questions of the respondents, can be open or close and delivered face to face or over the phone but is an interaction between researcher and respondent. Can generate quant/qual data. Series of questions put to the respondent without researcher interaction (via post/hand delivered/internet). Largely quantitative data as questions are normally closed and can be called social surveys. The analysis of the media, often to see how a particular group are being portrayed/represented. This can be done in a quantitative way through counting frequency of occurrences or through textual analysis in a more qualitative manner. The systematic collection of mainly quantitative data from a fairly large number of people. Usually through questionnaires or structured interviews. Studies that are conducted over a long period of time and provide a longer term picture of a group to gain an understanding of social trends. This is when sociologists use in depth qualitative methods to immerse themselves in the lives of people they study in order to understand the lives of a particular group. More than one method is used in a piece of sociological research. Sociologists often refer to Triangulation or Methodological Pluralism to describe the purpose of using more than one method. Small scale research, conducted on a sub-sample of the population in order to check problems in the research and test for problems/bias in the research. Operationalising a concept involves defining it so that it can be accurately and effectively measured. Concepts must be operationalsied so that validity and reliability can be achieved. Moral guidelines that must be followed when conducting research. The BSA lay out ethical guidelines for researcher to follow in order to protect both researcher and participants. A concept that refers to whether the research and its findings give a true and accurate picture of what is being studied. Refers to whether or not the same results would be produced if repeated by the same reseacrher or by another sociologist, the replicability and consistency of results. When you are able to make claims about a whole population based on actually only studying a small sample. The ability to do this depends on the size and representativeness of a sample, a bigger sample would make one better equipped. When the research population change their behaviour because they know they are being watched, normally refers to observation and can result in lessening the validity. When a researcher becomes so involved in the life of the paeticipants, objectivity is hard to maintain and the research lacks validity . When a researcher reflects on their work in order to check they are being objective and have an acceptable degree of detachment from the research project. When the respondants are given the opportunity to verify the research findings in order to assess whether or not it is a true reflection of how they perceive things they said. When research loses objectivity/validity as the interviewer effects the truthfulness/honesty and quality of the responses. 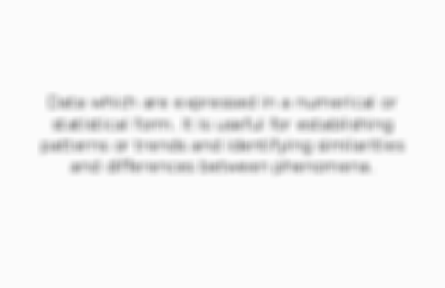 When the researchers characteristics can affect the validity of the research, often related to the researchers' physical or social characteristics. German word for understanding, closely related to the process of achieving empathy, understanding a situation from another's point of view. Researchers must 'step in their shoes' to understand their thoughts and actions. When more than one method is used in order to check the validity of the research findings. When more than one research method is used in order to get a broader and fuller picture of social life. 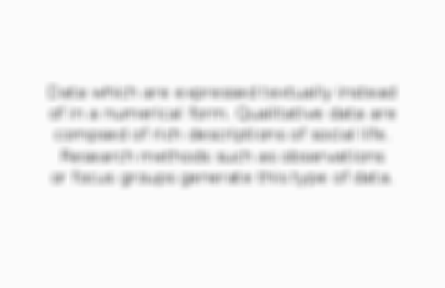 Theoretical approach believes in applying logic of natural sciences to researching society, they prioritise objectivity and use quantitative data as it is more quantifiable, measurable and reliable. This theoretical approach ensures that research methods are fit for purpose - they prefer results to be qualitative and quantitative and also like to ensure that data can be cross checked. These theorists like research that explores the role of women - generally qualitative data used, ensuring meanings, feelings, experiences, and opinions are gathered, however this is not exclusive.